Best time to visit Vienna? Winter is my favorite season in the city. If this was a ski resort, the decision would be easier to understand. But it isn’t. So some explanation is in order. You probably have some image in your mind about a fairytale Christmas. Snow on the ground, crisp night air, groups of friends half-hidden in the steam rising from mugs of hot mulled wine, roast chestnuts, and the kind of Christmas decorations we used to have before we discovered plastic and fluorescent paint. 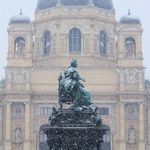 That is Vienna in winter (not always with snow, admittedly). It can get bitterly cold; it’s not impossible to get down to -15 centigrade (5 Farenheit) on some days. Snow on the roads soon turns to brown slush. And if you’ve any kind of profile on your shoes and boots, you’ll end up picking bits of grit out of them for weeks to come. But it’s all worth it when the sun goes down and you wind your way through one of the Christmas markets. Christmas in Vienna has taste. Soft lighting, decorations made of wood and straw. You know those wintry Victorian scenes you get on the side of old tins? Exactly. If you only visit Vienna once, and you’re not averse to a bit of a chill in the air, then visit when the Christmas markets are on. That usually means mid-November until Christmas (and often beyond). One advantage of the summer is that large proportions of the local population disappear to summer residences or vacations, so there’s more room for those who stay. The disadvantage is that the migrating locals are passed on their way out by thousands of tourists coming in. Popular tourist destinations can get very busy. Apart from the good weather, the summer also brings the street culture to life – you can sit outside into the night enjoying the delights of the many excellent cafes, bars, restaurants and wine taverns. Many have their own gardens just for that purpose. Vienna’s municipal authorities also do a fantastic job of brightening up the city with flowers, and not just in parks and gardens either. Summer also brings out the ice cream sellers. And we’re not talking little vans and plastic-tasting ice cream here. Italian ice cream makers spend the winter back home in Italy before opening up to the Viennese public in the warmer months. A good tip for the city center is Zanoni (actually open all year – walk along Rotenturmstraße from St.Stephens cathedral). The main square in front of the Rathaus also turns into a gourmet street food market and outdoor cinema for most of the summer. Not to mention all the other festivals. There’s nothing inherently bad about Vienna in the spring and fall/autumn, but not a lot to make it stand out against the glories of winter or summer. One big advantage is that it’s relatively empty of tourists at these times. Since most sites stay open year-round, visiting the top attractions involves less jostling than at other times of the year. As Vienna grows in popularity, this is quite an advantage. The Easter period is an exception to this rule, of course. For more help with timing, check out the events by month page – perhaps there’s something specific that grabs your interest?